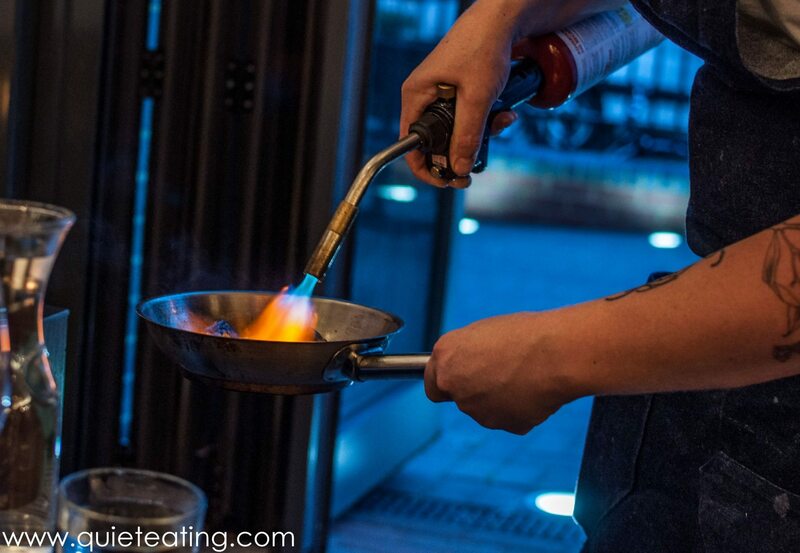 One of the new hip restaurants opening in London in the last couple of weeks. Run by the same cook who was at the helm of the highly rated Manor and Diary. Having been to neither of these restaurants, our hopes were built upon crowd expectations and we had high hopes of finding our own nirvana at Paradise Garage. First up to whet our appetite after having braved the far east (i.e. 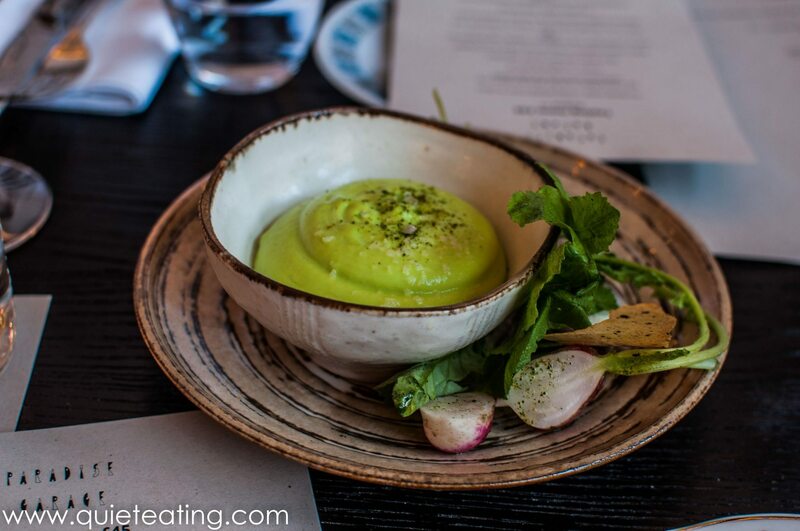 Bethnal Green) was a delightful pea mousse, wonderfully light along with lovely lightly fried potato skins. A delightful way to start the meal. Next was another little bite which looks like preserved sausage. 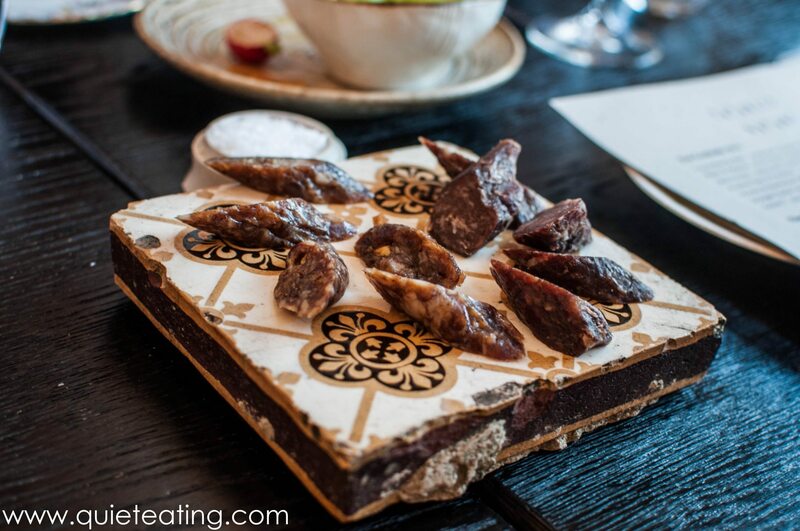 It tasted strangely like the preserved Chinese sausage which has a very strong almost mummified taste with a little too generous use of the salt (and more salt on the side if you want it from the dipping dish). I’m not sure if I was a particular fan of these. 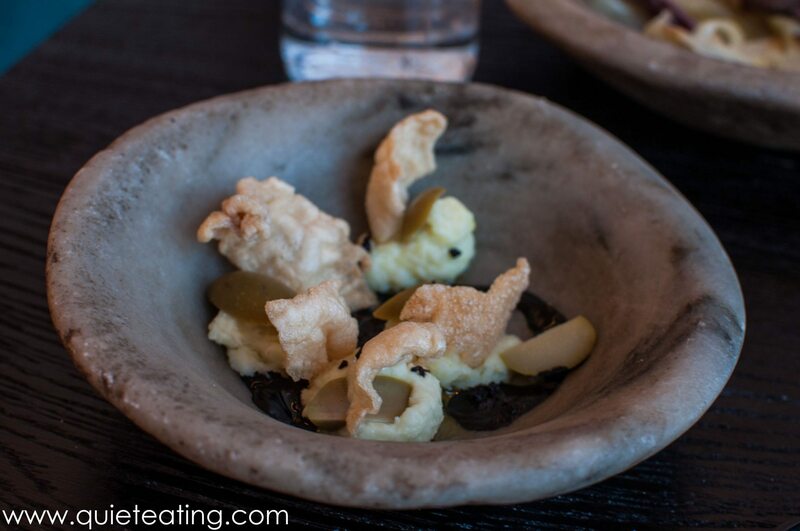 Salt cod brandade, squid ink, olives and shell fish. This was crunchy and flavourful especially when the creaminess of the squid ink/olive emulation was added. A dish to return for. 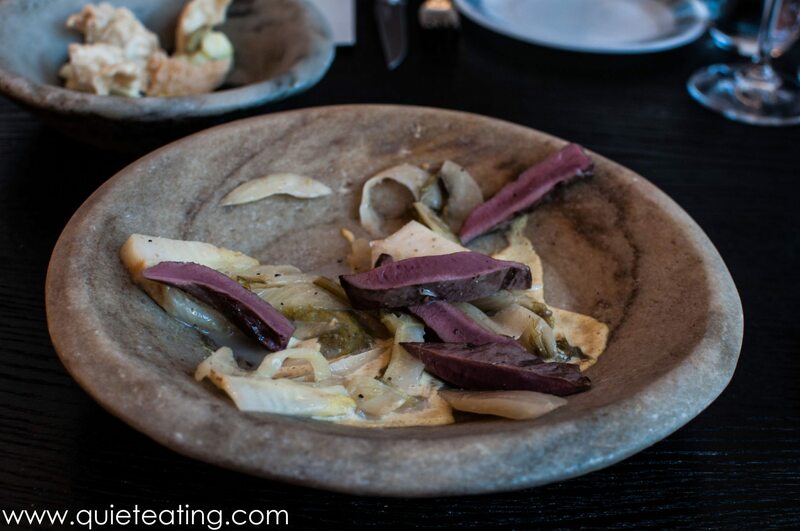 Lamb heart, fennel kimchi & black pepper. The lamb hearts were carefully cooked, remaining pink in the middle lending a lovely texture of bounciness to the meat. The kimchi was slightly too salty for my tastes. As one of my fellow diners remarked, each individual element was good and obvious attention to detail had been lavished in the preparation of this dish but the combination didn’t really seem to go together that well. Sourdough bread, smoked whiskey butter. 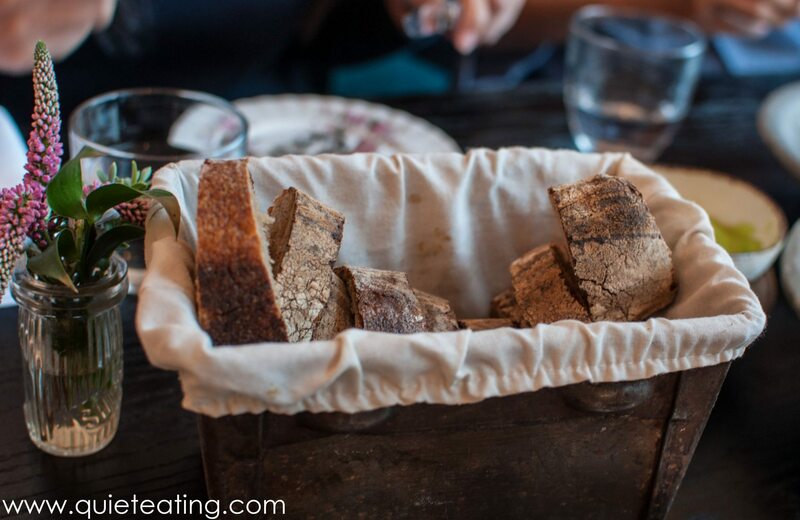 The bread was warm and soft and added a delightful bounce to the palate with the inside being both soft and springy. The whiskey butter was very light (so light that one of my fellow diners managed to flip it all over the table as he underestimated his own strength) and added a light savoury touch to the sourdough. The pity was that there wasn’t more of the bread! 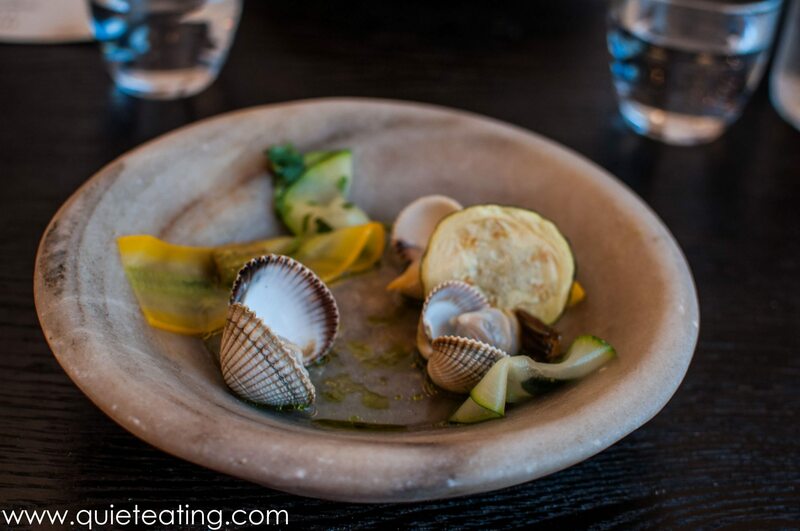 Cockles, courgettes & herb oil. The cockle were fresh and cooked with careful precision. However, the pickled courgettes managed to spoil the dish as they added an unwelcome citrus flavour reminding me of when dishes were not properly rinsed and I unfortunately tasted the lemony Fairy liquid first hand. Tomatoes, eel jelly & nasturtium. 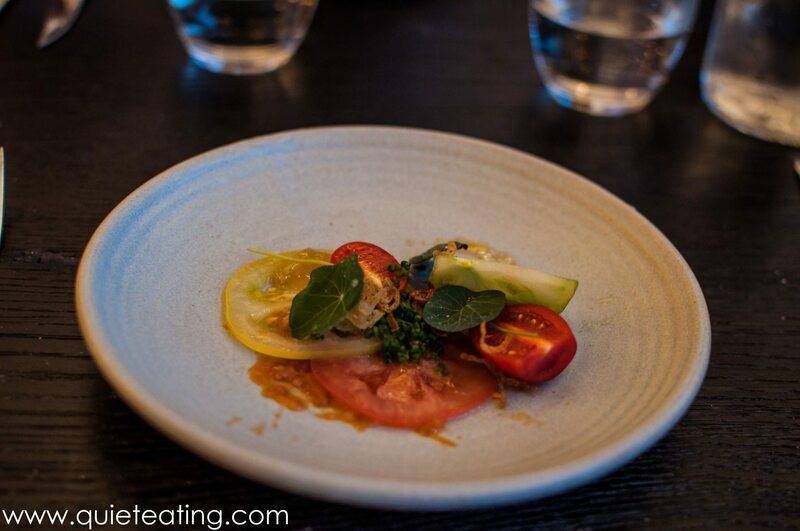 The quality of the tomatoes was very evident although we all found it a bit difficult to figure out where the eel jelly was as this dish, although pleasant, seemed to be missing a fishy (or eely) taste and it was only faintly sour. 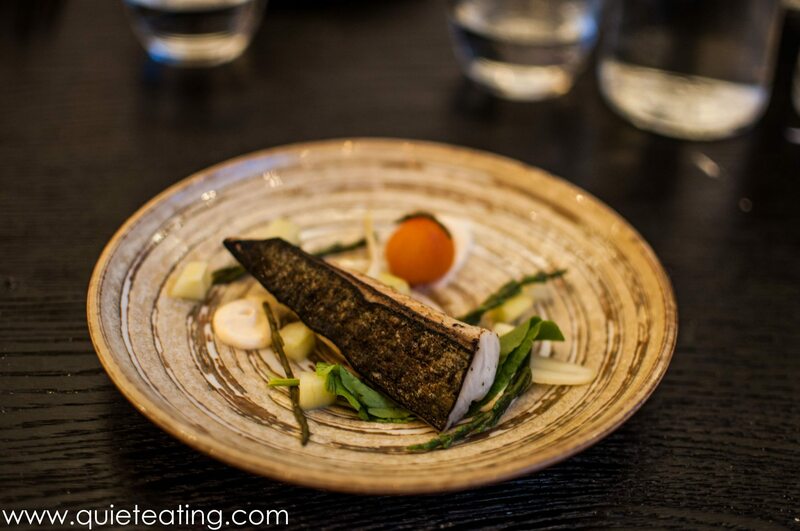 Next there was a bit of theatrics as the mackerel was brought out raw and toasted in front of our eyes. Mackerel, smoked cod roe, pickles & rice crackers. I found the mackerel to be excellent – soft, flaky and moist. A far cry from the smoked mackerel I would eat in my student days. That almost killed my love of this fish but thankfully better cooks prevailed. 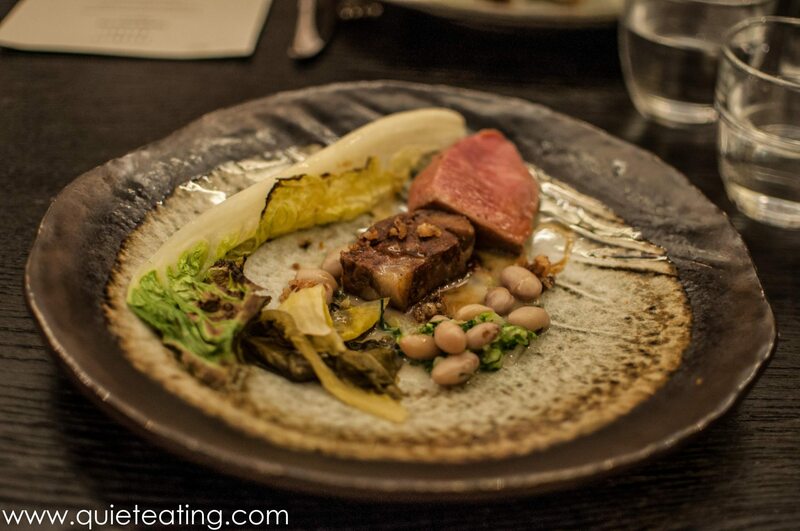 Iberico presa, pig head, borlotti beans, anchovy & lettuce. Another stand out dish. While waiting for this dish (20 minutes?) as the restaurant staff informed us that there had been an accident with the pork in the kitchen, we grew more and more hungry. Which only made the dish taste even more divine when it came. The pig’s head was excellent – crispy, moist and flavourful. I’ve had several pig’s heads in the past year or so and this definitely stands near the top. Although, strangely for this course, we were told that we had to order this in pairs. When we were told this, we expected a full sized pig’s head rather than the more minute portions on offer. Disappointment reigned once the pork finally arrived. Cucumber sorbet, melon & basil. A little palate cleaner before the dessert. As my fellow diner remarked, it doesn’t taste of vinaigrette! The cucumber sorbet and melon was very refreshing and cleansing. We had hopes that the dessert would be missing this sour note. Caramelized white chocolate, strawberries, raspberries. The white chocolate was in particular very welcome. The creaminess of this reminded me of the pea mousse at the start. Although a bit heavier, it still managed to stay on the right side of dessert weight. 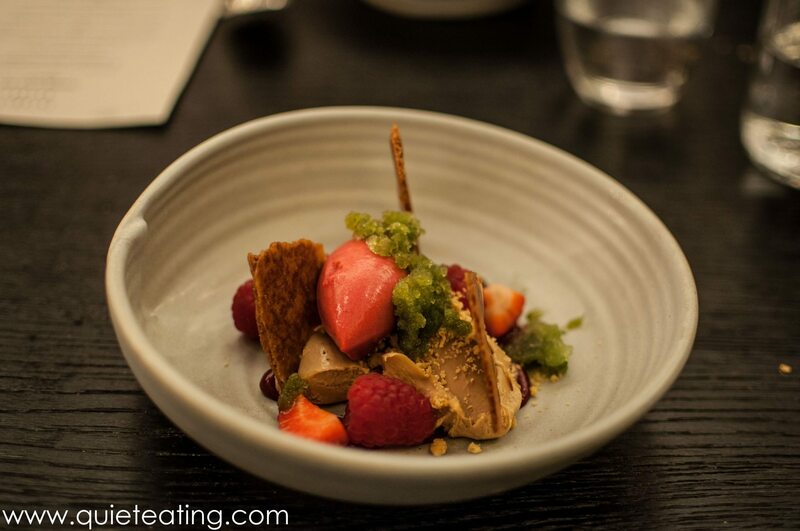 The strawberries and raspberries only complemented this delightful white chocolate cream. Flavoured soft bread. It tasted a bit like marshmallows and a little bit of alcohol? Interesting to finish the meal with some bread. Dinner had its high points and its more unusual talking points as it had its share of hits and misses. It seems that they are still sorting out teething issues with the service as our dinner took 3 hours to complete. A hint to this may have been the occasional sounds of smashed crockery coming from the kitchen. 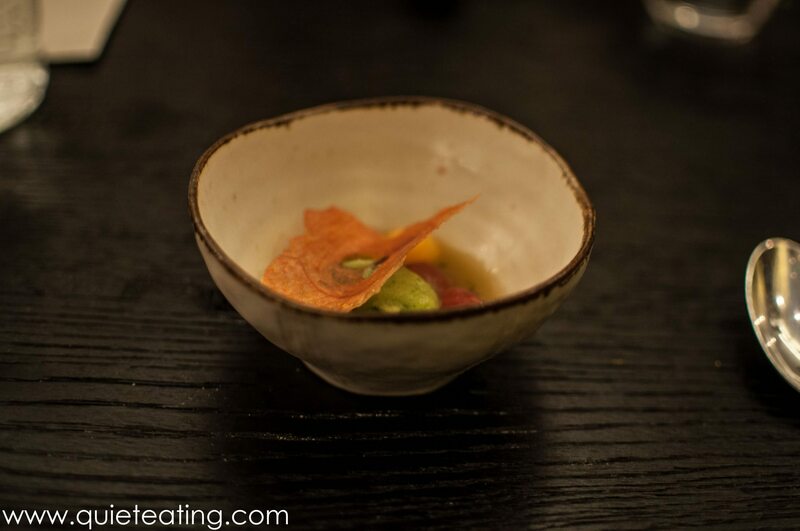 The preponderance of pickled foods and a slightly overpowering fondness for citrus flavours marred our meal. 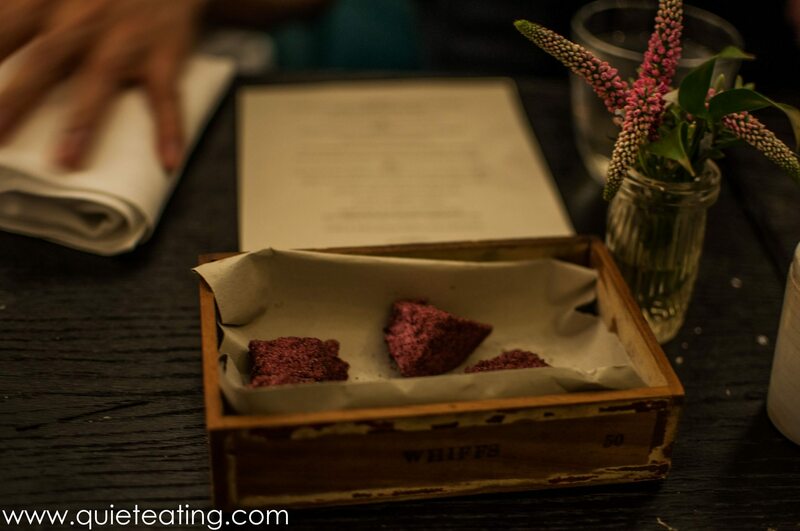 These could have been overcome by the obvious attention paid to the ingredients but by the end of our 10 course dinner we unfortunately were left hungry… The first time that I have suffered from this while having a tasting menu. This meant that I left with a little bit of a sour face. Now off to KFC. Dinner (many courses) was GBP 45 for the tasting menu, without service or drinks.